Soak your coffee pot with vinegar, and wash your mesh filter with soap, if you have one. Fill the coffee pot with the vinegar and run the coffee maker. 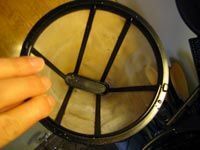 After the coffee maker has run once through, remove the coffee filter and rinse it off. Remove the coffee pot and pour out the remaining vinegar. Refill the coffee maker with vinegar and run the cycle one more time. 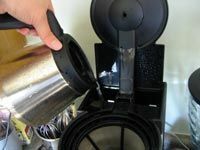 Cleaning a coffee maker is not rocket science, and there are a number of ways to do so. However, cleaning a coffee maker these days is the equivalent of sweeping the steps of a cathedral–coffee has become a sacrament rather than a supplement. Here, I will focus on how to clean a coffee maker with vinegar, because vinegar is natural and free of toxic residues. Vinegar is also a good solution because its acidic properties help to get rid of lime scale, mineral build ups, and any oils left over from brewing various beans. If you leave these things in your coffee maker you’ll not only risk breaking the coffee maker, or wearing it out, but you also risk tainting the taste of each pot of coffee you brew. So, it’s important to make sure you do this right. 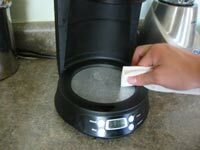 This is how I clean my coffee maker–no chemicals, no gimmicks. Soak your coffee pot with vinegar, and wash your mesh filter with soap, if you have one. While you’re doing this, you might as well do some aesthetic touch ups on the outside of your coffee maker and the heating element at the base. Do this with vinegar as well. The reason I soak the coffee pot is because I own a particular kind of pot that functions as a thermos, rather than constantly heating the coffee while the coffee maker is on. I soak it for about 15-30 minutes. Fill the coffee pot with the vinegar and run the coffee maker. Now, if you haven’t gotten the chance to clean the filter, what you can do is take the coffee pot out from under the filtering mechanism so that the hot vinegar collects in the filter and cleans that as well. The acids in the vinegar should clean away the scaling and mineral deposits that eventually clog and strain your coffee maker. Sure, it smells bad, but it works! After the coffee maker has run once through, remove the coffee filter and rinse it off. 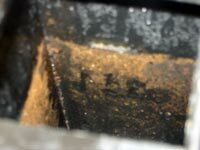 If you have a mesh filter, you may notice a whole bunch of junk that came through the machine. That’s the stuff you’re trying to get rid of: pieces of old coffee beans, residue, oils, and minerals built up from the repetitive evaporation of non-deionized water. Remove the coffee pot and pour out the remaining vinegar. 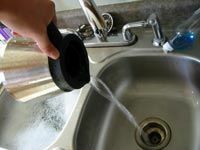 Once you’ve done that, rinse out the coffee pot a couple of times to make sure you’ve gotten rid of all the particles that came through the coffee maker. Now, you’ve completed the first in a series of three cycles you’re going to run before your coffee maker is clear for inspection. 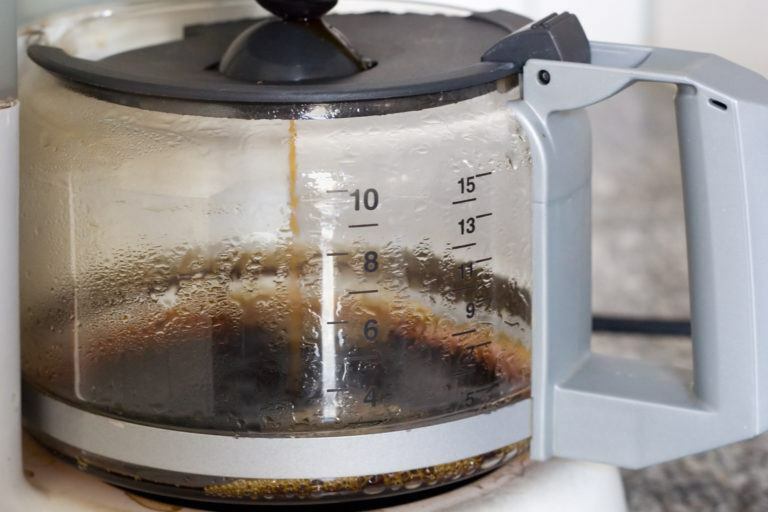 Refill the coffee maker with vinegar and run the cycle one more time. Because the vinegar works at the lime and mineral build up by a chemical reaction, there is a possibility that without scrubbing the machine you didn’t get all of the grime. Repeating the process one or two times more will ensure a good, clean coffee maker. Then, for your final cycle, run pure, deionized water through the machine to make sure you get all of the vinegar out. Of course commercial coffee cleaning products are going to look attractive. They offer you a guarantee that your coffee maker will brew faster and that your coffee will taste better–and all of these claims are true. Really, what you’re paying for when you buy a commercial coffee maker cleaning detergent is a descaler in a pretty package. In other words, you’re paying for some acid. That is why I use vinegar rather than some gimmicky commercial coffee brewer cleaner. But, if you must know, the most popular coffee brewing cleaning products are made by Urnex. There are a couple samples of and descriptions of these products in the sidebar to your right. Just do me a favor and do some research before you buy a coffee cleaner online. Chances are it’s a descaler or some plain solvent wrapped up in a professional looking package. Urnex Cleancaf coffee cleaner packets seem to be the most popular coffee maker cleaning products on the market today. 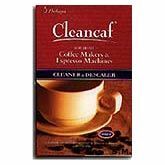 You can get Cleancaf powder at Amazon. 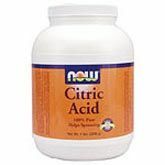 Citric Acid is a great alternative to commercial descalers and coffee maker cleaning products. It’s cheaper, too, and readily available in most grocery markets. A few teaspoons of this powder run through your machine should clean up that limescale and mineral buildups.